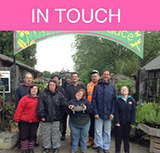 Canterbury Oast Trust (COT) was established in 1985 by a small group of parents anxious to achieve a higher level of care for their disabled children than was then currently available. Starting from a small rented property in Canterbury housing just 3 residents, COT has grown steadily over succeeding years to become one of the most dynamic, ground-breaking and respected providers of residential and community supported care in the South-east, now with 18 Trust-owned properties spread over Kent and East Sussex, housing just under 100 residents. A major founding principle has been the establishment of profit making ventures to provide quality education and training to our residents and service users. These ventures break down stereotypes encourage interaction with the public and enable our service users to serve their local communities, providing real not pretend jobs and to produce surplus funds to continue expanding and improving care, opportunity and training to an ever growing number of internal residents and external trainees. We now also provide support in the community to 28 former residents of our care homes who, as a result of their successful and intense training within the Trust, have now progressed to a stage where they can live and work more independently. And it works - Trust ventures now include the South of England Rare Breeds Centre, opened in Woodchurch in 1991, welcoming over 100,000 visitors a year to its Farm, Granary restaurant, Conference centre, Art at the Farm and Plants and Produce; its Coterie tea rooms in Rye High Street which has been serving locals and tourists since (1993); its Poulton Wood (conservation) project in Aldington where we also provide training facilities for IT, literacy and music. Warm, family homes sit at the heart of our community, profitable ventures, structured on-going training, real jobs - this self-help is the very essence of COT and the key to its ongoing success.